Virtual reality. Murder. Werewolves. And teen girls! In a future where nothing is as it seems, can old legends come true? In the near future, humans will communicate almost exclusively through monitors, making real interaction a rarified and weak occurance for those living in a near totalitarian society. In this new world of communication, children are only allowed to interact personally on school grounds. So when a serial killer starts slaughtering junior high children the communication routes go under futher surveillance. 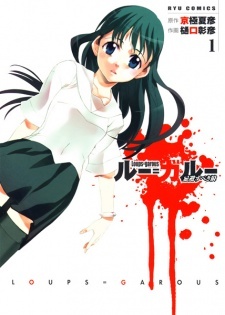 And despite all the safeguards put in place to avoid physical interaction, the killer's latest victim turns out to have been in contact with three young girls: Mio Tsuzki, a certified prodigy; Hatsuki Matsuno, a uiet but opinionated classmate; and Ayumi Kono, her best friend. And as the girls get caught up in trying to quell curiosity under such terrorist scrutiny, Hatsuki learns that there is much more than meets the eye of their monitored communications.